Sōhei (僧兵, Sōhei? ), lit. 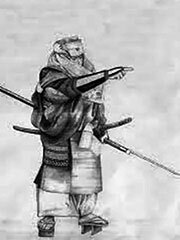 «priest warriors,» were Buddhist warrior monks of feudal Japan. At certain points of history they held considerable power, obliging daimyō to collaborate. They were similar to the mountain ascetic yamabushi (山伏), but unlike the solitary yamabushi, sōhei generally organized into large armies or mobs. The most famous of these mountain monasteries, arguably, is the Enryakuji on Mount Hiei, just outside Kyoto. The sōhei shared many similarities with the Western lay brothers, members of a monastic order who might not have been ordained. Much like warrior monks of Germany (see Teutonic Knights), or other religious orders, such as those involved in the Crusades, sōhei were not individuals, or even members of small, individual isolated temple, but rather warriors in a large extended brotherhood or monastic order. Any given ‘home temple’ of a sōhei monastic order might have had several, if not tens or a hundred, smaller monasteries, training halls, and subordinate temples. Warrior monks first appeared in a significant way in Japan in the middle of the 10th century, when bitter political feuds began between different temples, different sub-sects of Buddhism, over imperial appointments to the top temple positions (i.e. abbot, or zasu) Much of the fighting over the next four centuries was over these sorts of political feuds, and centered around the temples of Kyoto and Nara, namely the Tōdaiji, Kōfuku-ji, Enryakuji, and Miidera, the four largest temples in the country.The first armed conflict broke out in 949, when 56 monks from Todaiji staged a protest at the residence of a Kyoto official, over an appointment that displeased them. Protests of this sort continued through the 10th century, often breaking out into brawls in which some participants would be killed. In 970, following a dispute between Enryakuji and the Gion Shrine of Kyoto, the former established the first standing army of warrior monks. It is not entirely clear whether or not this standing army consisted of monks from Enryakuji, or were more like mercenaries, since Ryōgen, the abbot who established this army, also established a code of monastic conduct that prevented monks from leaving Mount Hiei during their 12-year training, from covering their faces, and from carrying weapons.In any case, beginning in 981, there were a number of armed conflicts between Enryakuji and Miidera, each the head temple of a different sub-sect of Tendai Buddhism. These disputes were, as before, over political appointments, and dishonorable etiquette. More often than not, these were cases of members of one faction being chosen as the abbot of the other faction’s temple, and the monks would protest. This continued, on and off, once stopping for as long as 40 years, through the 11th and into the 12th century. The armies became larger, and the violence increased, until in 1121 and 1141 Miidera was burned to the ground by monks from Enryakuji. Other temples became embroiled in the conflicts as well, and Enryakuji and Miidera united against Kofukuji, and, another time, against Kiyomizu-dera. At the end of the 12th century, Japan was plunged into civil war, and so while the feuds between the temples did not end, they became submerged in larger events. The warring Minamoto and Taira clans both tried to obtain the aid of the warrior monks of Nara and Kyoto, adding the temples’ forces to the clans’ already mighty armies of samurai.Taira no Kiyomori sent generous gifts of rice and silk to Enryakuji, ensuring they would not help his enemies, the Minamoto, who had allied themselves with the monks of Miidera. In 1180, in one of the more famous battles in which sōhei participated, the monks of Miidera, along with a force of Minamoto samurai, tried to defend the bridge over the river Uji, and the Byōdōin temple behind it, from an attacking Taira force (see Battle of Uji (1180)). The monks pulled up the planks of the bridge, to impair the ability of the samurai, on horseback, to cross. They stood their ground with bow and arrow, naginata, sword and dagger, but were ultimately defeated. However, despite their defeat, and simply for their defiance alone, Taira no Kiyomori ordered that revenge be taken upon the monks that opposed him. Miidera was burned to the ground once again, as were many of the temples of Nara. Only the Enryakuji escaped unscathed.Three years later, when Minamoto no Yoshinaka betrayed his clan by storming into Kyoto, setting the Hōjōji Palace aflame, and kidnapping Emperor Go-Shirakawa, he was opposed by many of the monks of Kyoto, including those from Mount Hiei. Following the Genpei War, the monasteries, to a large extent, turned their attention to rebuilding, first physically, and then politically. Their political influence grew stronger through peaceful means, and the warrior monks played only very minor roles in the wars of the 13th and 14th centuries. Violent conflict between the temples still occurred on occasion, once again over political and spiritual appointments, and related matters.During the wars of the Nanboku-cho Period, Mount Hiei took in the rebel Emperor Go-Daigo, and offered him sanctuary. Emperor Go-Daigo, along with his son, and the help of the sōhei of Mount Hiei, launched a brief rebellion against the Kamakura shogunate. The Ashikaga shogunate took power shortly afterwards, and supported Zen over the other Buddhist sects, drawing the ire of the warrior monks. Over the course of the 1340s-1360s a number of conflicts erupted between the Tendai sect temples, and those of Zen, especially Nanzenji. The Ōnin War, starting in 1467, was the prelude to over a century of civil war in Japan, and the stimulus for a reorganization of the warrior monks. Unlike the Jōkyū and Mongol invasions of the 13th century, the Ōnin War was fought primarily in Kyoto, and thus the warrior monks could no longer remain non-violent and neutral.In addition, a new breed of warrior monks was forming in the countryside. Where the monks of Mount Hiei had subscribed to the teachings of the Tendai sect, these new groups, calling themselves Ikkō-ikki, followed the dictates of the Shinshū set of beliefs. They were essentially coalitions of religious fundamentalist priests, farmers, and families, who were willing to literally fight for their beliefs. Ikkō-ikki translates to something like «devoted league,» but also had the connotation of «single-minded riots.» In 1488, their leader Rennyō, led an uprising against samurai rule, and secured Kaga Province for the Ikkō-ikki. From there they spread, establishing themselves in Nagashima, Ishiyama Honganji temple, and Mikawa Province. Their growing power base would eventually attract the attention of the likes of Oda Nobunaga and Tokugawa Ieyasu, who recognized their opposition to samurai rule, their determination, their strength, and their numbers.Tokugawa Ieyasu attacked the monks of Mikawa in 1564, in the Battle of Azukizaka, and failed to defeat them, but returned shortly afterwards with a contingent of warrior monks from his own religious sect, Jōdo-shū, and, after defeating the monks in battle, burned all their temples to the ground.As Oda Nobunaga rose to power at the end of the 1560s, the monks of Enryakuji regained their military might, and fought a number of skirmishes, in the streets of Kyoto, against a new rival sect, Nichiren. They eventually burned all of Kyoto’s Nichiren temples to the ground, and then proceeded to seek allies among the local lords, or daimyō. Unfortunately for them, the Asai and Asakura clans they allied with were enemies of Oda Nobunaga. Beginning on September 29 1571, Nobunaga’s army of 30,000 attacked Mount Hiei, destroying the Enryakuji. Though it was rebuilt, the standing army of warrior monks would never be reconstituted.Nobunaga then moved on to fighting the Ikkō-ikki in their fortresses of Nagashima and Ishiyama Honganji (see Sieges of Nagashima, Siege of Ishiyama Honganji). In the summer of 1574, with the help of former pirate Kuki Yoshitaka, Nobunaga essentially blockaded the monks’ fortresses and starved them into submission. The 20,000 inhabitants of the fortress went up in flames along with their home. Two years later, Nobunaga returned to Ishiyama Honganji, which he had failed to take earlier. At the two Battles of Kizugawaguchi, Nobunaga defeated his enemies, the Mōri clan, who had naval control over the area. The monks were finally forced to surrender in 1580.In the 1580s and 1590s, various factions of warrior monks sided with either Tokugawa Ieyasu or his rival Toyotomi Hideyoshi, fighting in a number of battles and skirmishes.When Tokugawa Ieyasu finally defeated the last of his enemies and took control of the country in 1603, the time of the warrior monks finally came to an end. While most warrior monks of fiction are more closely derived from Chinese schools of martial arts, drawing upon imagery and concepts from Tibet and Nepal, there are a significant number of fictional references to the Japanese concept of a warrior monk.For example, in CrossGen’s samurai comic book «The Path,» many of the chief characters are warrior monks from the Takaihashi monastery; the main character of the series, Obo-San is more like the yamabushi type of monk.Also, in the anime series Samurai Champloo the heroes encounter a group of Sōhei in one episode. Finally, there exists a Corporation called The Sohei Brotherhood in the MMORPG Eve, modeled after the famed historical warriors. Turnbull, Stephen (2003). ‘Japanese Warrior Monks AD 949-1603’. Oxford: Osprey Publishing.